I was admiring a stunning installation piece shimmering undulating against a panel when a gallerist manning the Galerie RX booth at the Korea International Art Fair last month asked if she could take a photo of me and the piece. I was wearing hanbok as part of an assignment I was working on at the time and she explained that she wanted to show the artist that his work was being shown in Korea. The artist was El Anatsui, a Ghanaian artist now based in Nigeria, who weaves together discarded bottle caps into large tapestry-like installations, she explained. The next day, sorting through old mail, I happened upon a name that seemed faintly familiar -- an invitation to the opening of “El Anatsui: Topology of Generosity” at the Barakat Seoul. Anatsui happened upon on a bag of used liquor bottle caps by some bushes near his studio in Nigeria in 1999. The bag languished on his studio floor for more than a year before he struck upon the idea of recycling the caps into works of art. “There are used bottle collectors and the number of bottle caps that are available is a reflection of the level of drinking that is going on,” said Anatsui in an interview with The Korea Herald on Sept. 27 at Barakat Seoul. Anatsui has elevated what is typically thrown out as garbage into high art. His sculptures -- he prefers this term for his tapestry-like works -- have won him international recognition, including the prestigious Golden Lion for Lifetime Achievement Award at the 2015 Venice Biennale. On Wednesday, he will receive the Praemium Imperiale, an art prize carrying a prize of 15 million yen ($134,000), at a ceremony in Tokyo. Anatsui grew up in a mission house in Ghana and was isolated from his roots -- a cultural disconnection that continued at the university where he studied art. It wasn’t until he had nearly completed his studies that he discovered African art at the nearby National Cultural Center. “It jump-started my career,” said the artist, who professes to prefer configuring things in the abstract instead of the representation art learned in school. Anatsui is particularly interested in the signs and symbols that are printed on the funereal costumes of his culture. “(A) funeral is an occasion to reflect on life. It is an encapsulation of aphorisms. It serves to remind yourself about life,” said Anatsui. Those signs and symbols have found their way into Anatsui’s sculptures. At the Barakat Seoul, the massive “Skylines?” (2008) is installed in a first-floor corner space, hanging top to bottom and arranged to show movement within the still piece. Anatsui gives no instructions on how his sculptures should be displayed. “It arrived neatly folded and we were given free rein to install it as we saw fit,” said Park So-hyun, head curator at the gallery. He did add a few final touches when he arrived in Seoul, Park added. 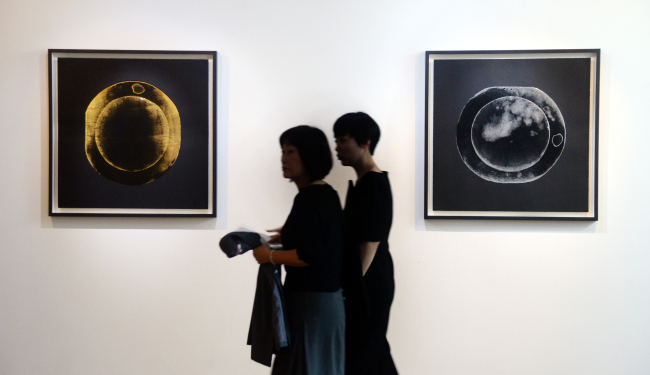 Earlier in the day, the artist was at the Leeum, Samsung Museum of Art in Hannam-dong to view his work on display. He found that the piece “They Saw Us Through Puffs of Smoke” (2011) was mounted incorrectly and pointed it out to the curator. “It is mounted on a black wall. There is a transparent part that should show light,” he said. Anatsui’s work was first introduced to Korea during the 2004 Gwangju Biennale when “Waste Paper Bags” made with aluminum printing plates was shown. A discarded liquor bottle cap isn’t of much use. But put together by Anatsui, they are transformed into striking works of art that are no less luxurious than the golden leaf paintings of Gustav Klimt and no less majestic than Byzantine mosaics. However, Anatsui’s works are far more than just brilliantly beautiful art. The whole community is involved in the art process, making the works collective pieces. The pieces that you see installed in museums and galleries around the world represent months of work by villagers in a small Nigerian town. The installation of his works are left up to each institution, getting the curators involved in completing his work. Finally, Anatsui encourages individual viewers to determine what they see in his works and to appreciate them in their own ways. The artist is also a job creator, providing jobs to villagers. Young boys who have finished high school come to work at the studio. “It doesn’t require skills so a boy can come and start working the same day. But it is laborious so I need a lot of people,” he said. “Many of them go on to study technology, medicine, law and economy at the university while working at the studio -- but not fine art,” he said with a chuckle. “They need to be big. The medium I work would be inconsequential in small, domestic scale. 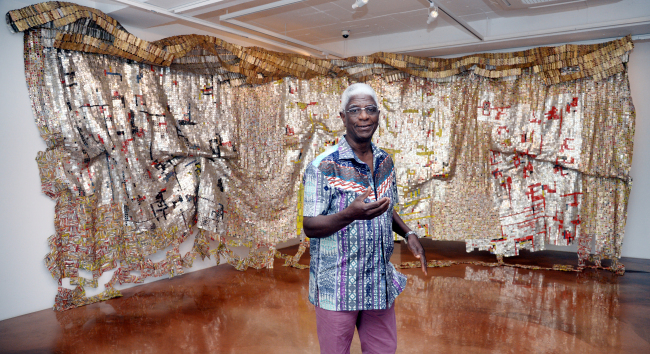 People won’t take notice of it,” said Anatsui about the size of his works. The smallest work measures 2 meters by 2 meters while the largest bottle cap sculpture, “TSIATSIA -- searching for connection,” which was draped over the facade of the Royal Academy of Art in London in 2013, is monumental at 15 1/2 meters tall and 25 meters wide. As for the curators who give his sculptures the final form, Anatsui said he is satisfied with their interpretations, most of the time. “It works when they are bold and confident enough. I learn something new from them, too,” he said. Anatsui, who has been teaching for almost 40 years, tries to inculcate the value of originality in his students. “Each and every individual has a particular style that works for him. So the biggest challenge is to discover that,” he said. He also encourages the students to try as many media as possible, so that they may find the medium that is right for them, and when do they find the right fit, to stay focused. “It is only by persistence that you will understand the language and qualities of that medium and be able to speak with it,” he said.